I’m kind of in love with contact paper. Do you know about contact paper? You can find it in craft supply stores, and sometimes at Target or other similar stores, too. It’s a nice, thick vinyl (clear) that’s sticky on one side. It comes in rolls, with quite a bit on the roll for about $10. And there are soooo many great things you can do with it. 1. Tissue paper sun catchers: Cut a big piece, peel off the paper, and put the sticky side up on a table. Let your little one place small pieces of tissue paper all over the place! When there’s a satisfying amount of tissue paper, cut another piece of contact paper, peel the paper off, and stick it to the sticky side of the first sheet. Then cut your sun catcher into whatever shape you like, and use a hole punch at the top to make a hole that yarn can go into to hang it up. 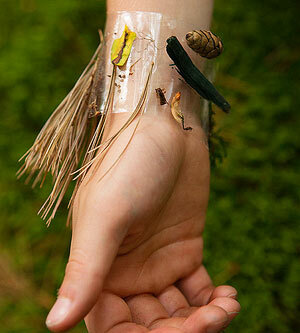 Bonus: Make a sun catcher with other stuff too, like leaves and grasses, for example. 2. Scratch off Tickets: I tried making these with a pinterest post that I kept seeing, where you put paint on top of white crayon. It didn’t work. This contact paper version did, though! Be sure to add dish soap to your paint, too! You can personalize these in a number of ways and make great gifts for all sorts of occasions. 3. Nature bracelet: When you’re going on a nature walk, make these fun bracelets, sticky side up, so that your kiddos and collect flower, leaves, and whatever else they enjoy. If they want to keep it, use a hole punch on each end of the bracelet, and tie it on with yarn. 4. Create a Sticky Wall: Tape some contact paper, sticky side out, to a foam board, easel, or other hard surface. 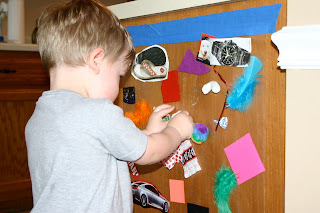 You can let your kiddos stick all sorts of things to this, and they’ll come off easy enough too. You could try little plastic animals, plastic beads, words or letters on cardstock, alphabet magnets, and so much more! 5. Easy bookmarks: Cut out some card stock in a rectangle, decorate it with stickers, markers, crayons, etc. Cover both sides with contact paper and cut it out (with contact paper sticking out a little further than the card stock), and you have a great, easy gift that won’t just sit around! 6. Make your own stickers: If you’re comfortable with your little ones using permanent markers, let them make their own stickers! Using an assortment of colors, have them draw pictures on the contact paper (before you peel of the paper on the sticky side. Then cut the stickers out and have them place them on paper! Fun! 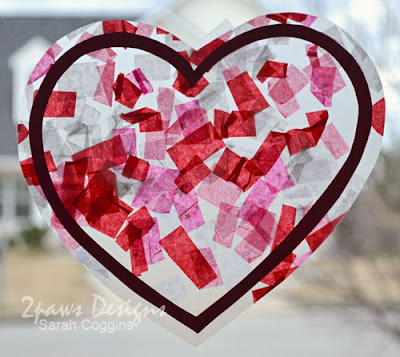 There’s so many more great projects you can do with contact paper, so maybe I’ll make another list some time! « Valentine’s Day is Coming!